We open to a scene in Portugal. Mister Selim, Delilah’s companion is creating a fiery distraction for her courageous rescue attempt. Twenty four pages of action, swoops, sword play and fire follow, welcoming readers to the latest adventure of Delilah Dirk. This book is the second to follow the cunning, stunning heroine as she treks around the globe, a marauding superhero of old. Tony Cliff has created a feisty, strong woman in Delilah whose quick wit, strength, and courage are focused upon even though her physical beauty is evident to the reader. A lesser author would regularly remind their readers of their heroines beauty. Here it is simply a characteristic, and an insignificant one of the remarkable woman. Cliff deftly transports the story from nation to nation while maintaining a sharp and compelling story which succeeds as a stand alone, but will leave readers craving more. In this installment, Delilah and Mister Salim sail to England after she is falsely accused of being a spy. Salim is shocked that Dirk would risk going to the very nation that is hunting for her, but she is confident that she can hide. Almost unrecognizable in her “real” identity, Alexandra Nichols, we learn about her upbringing and heritage and she is fortified to continue her quest to make the world a better place. Cliff is a masterful illustrator as well as story teller. His expressive faces, splashy battle scenes and glorious landscape are a joy. The color palette is carefully rendered throughout the book with gradations from blue, to green, to red tones which help intensify the action, or project the calmness of the environs. 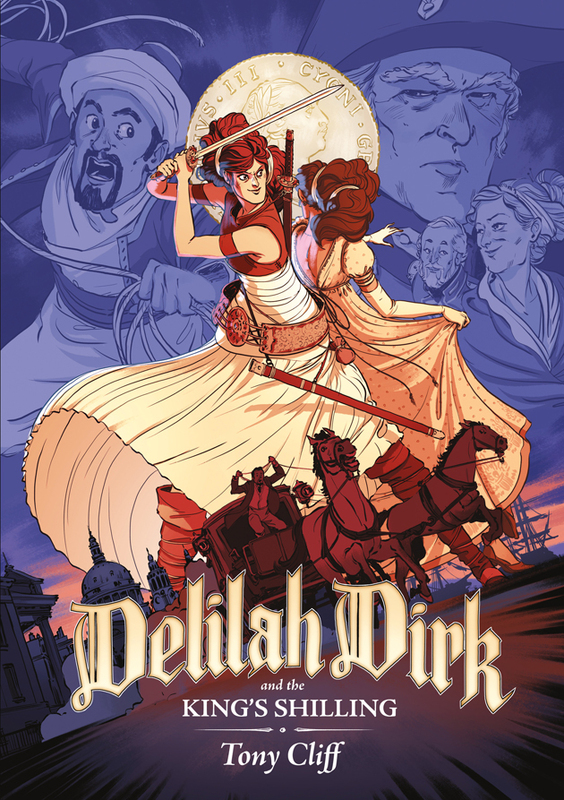 The Delilah Dirk books are printed on lovely thick pages which wear well, and are appealing for reluctant readers. The push of action may also compel readers unaccustomed to reading about the 19th century to pick up this exciting graphic novel. It is, quite simply, a must read for contemporary graphic novel fans and may be used as a powerful tool to encourage readers age 12 and up to keep picking up books. *Thank you First Second Books for providing me with a review copy of this title in exchange for my honest review. Next Teen Book Con: Houston YA Fans Can Meet Over 20 Authors FREE!